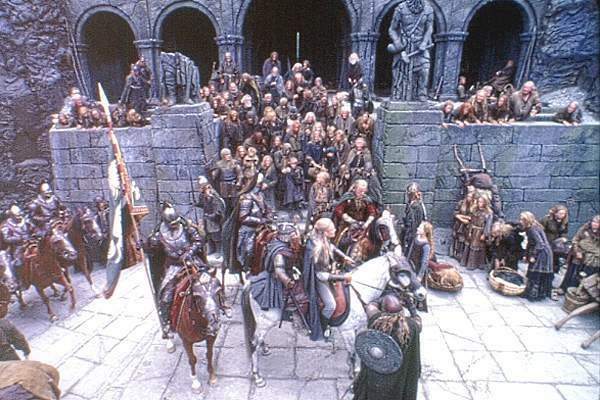 King Theoden orders the evacuation of Edoras. Eowyn help to pack but also is practicing with her sword. She has put down her royal grab and is dressed practically for travel. 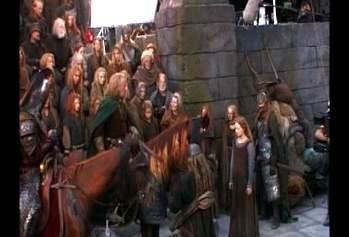 Aragorn enters and after a clash of weapons, they talk for a while. In the next scene, we see her wearing her fir trimmed coat over the top of this out. When they reach Helm’s Deep, she takes it off again It is clear that she wears this outfit underneath her coat. Often we call this a dress there's no actual pics of the 'skirt' part only so far. The KO doll was canceled, but folks that got to see the preproduction model said it was split and there were trousers underneath. However, we don't know if it's side splits or split for ridding, or side split for just more movement. Vote for the side slit is that we have not seen a seam dead center front. However the fabric is very crinkled and drawn into the neckband, so... we might not see it. We assume it has normal set in sleeves but it would be better to get a closer look to confirm. Close up's of the high resolution images show a beautiful nubby and crinkled textured soft blue fabric. There are rows of gold thread running though it. There is a good chance the original is silk. The sleeves are tight but can be rolled back for action. We suspect that there is lacing on the inside sleeve that is therefore tied to the upper arm when her sleeves are rolled up. Again, this is going to be very tough to match but not impossible. If the tunic is only going to worn with the jumper, then the popular chemise weight cotton gauze could be used. Fabric would probably need to be dyed. A light to medium weight blue linen could be washed and "broom stick pleated"
Folks have talked about sewing or weaving in a gold tread. The outer layer has a scooped neck with leather braiding along the edge. This overdress is sleeveless like a "jumper". Other ladies at Helm's Deep are wearing Saxon style overdresses - short, just below the knee length but Eowyn's comes to the ground and has open sides. These are not as wide as the medieval "gates of hell". They're about 6" side at the widest and are just an opening on the side seam. These open sides are laced together with gold cord in an intricate pattern.. The lacing is about 1 cm in diameter, and goes from under her arm, down to just below her hips. It’s tied as a series of knots. Jumper is only open to the hip. The slightly flared skirt section is closed. The fabric is slightly coarse. Looks like a standard weave. Medium weight linen. This jumper also has small cap sleeves, that are about one inch (2.5 cm) across. Which direction does the leather braid on the neckline point to? What is the exact way that the side lacing is tied? We never get a good look at the shoes... but they're brown. Assumption: they are the same low brown lace up boots we see with the dark gown. She wears no jewelry that we can see. Can see neckline of both layers, notice how thin fabric is gathered and both top edges are closely bound. There is a seam on the edge of her shoulder (no more than an inch or two from the edge). You can see that there is a gap in the side, and it looks like there is some kind of tie. More shading than anything else, but may help once we're looking for more details. Almost a full shot, same as above.